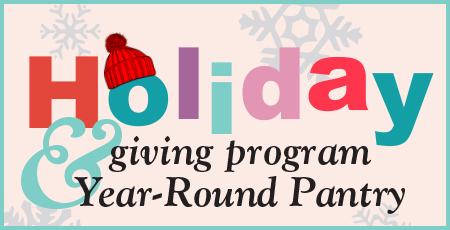 The Holiday Giving Program is an opportunity to support families and children during the long winter months of the holiday season. Family & Children Services will match community donors with the needs of our clients. Community donors provide in-kind donations, such as gifts, food, household supplies and/or personal care items, to families, children, and individuals in great need throughout the season. If a donor would like to expand the impact of the Holiday Giving Program without being matched with a client family, the In-House Holiday Store is another option to assist our clients. Often, a family’s need comes to the attention of their therapist or worker during the final hours before the holiday. The In-House Holiday Store allows our staff to respond and provide individuals with donated items allowing them to have something to give to their children during the holiday. The In-House Store is entirely stocked by community donations from individuals, schools, churches, local businesses and corporations. Who Does Holiday Giving Serve? Holiday Giving helps clients of Family & Children Services. Many of these families include some of the most vulnerable children in Kalamazoo and Calhoun counties. The season, while a joyful time for many, can represent a time of fear and desperation for many we serve. From the little girl whose mother suffered a stroke to the family with the father who was recently unemployed. Holiday Giving reaches out in a caring way to provide help for those who need it most. Who Was Served in 2017? 596 individuals were matched with 138 community donors. Another 628 individuals were served through the In-House Holiday Store that was stocked by community donors. Donors included individuals, families, community organizations, schools, small businesses and corporations. We sincerely appreciate your interest in helping families in need. Your contribution will make a big difference this holiday season.